After receiving a series of death threats by post, the Prince of Wales feels that some time spent away from London will calm his frazzled nerves. So he escapes to Brighton — where Beau Brummell joins him as a guest. With guards posted at every door, the atmosphere is tense — especially under the scrutiny of Sir Simon. Hired by the Prince as his personal "food-taster," the odious baronet is a poor substitute for the polite company of London society that Beau is used to. Some refinement appears in the form of a new blend of snuff prepared by Beau's good friend Petersham. Sir Simon insists on sampling it before the Prince — only to keel over dead. Now, Beau's friend is supected of trying to assassinate the Prince. In order to clear Petersham's name, Beau will have to turn his quizzing glass on the crime . . .
"What makes this story so enjoyable are the author's characterizations and her effective use of the setting. 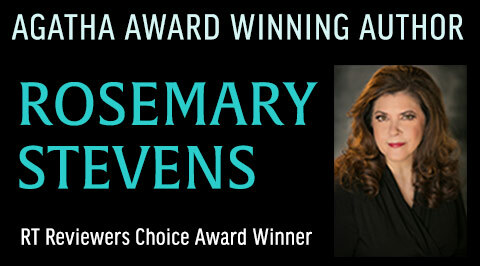 Stevens knows the era of which she writes intimately and this knowledge enriches her tale." "In her second Beau Brummell mystery, Stevens keeps to the high standard she set in DEATH ON A SILVER TRAY. It's the autumn of 1805, and the Prince of Wales, frightened by threatening letters, has moved with his entourage to Brighton to escape the unknown menace. There, during a walk on the beach, his friend Beau Brummell discovers the body of a young lady, whose identity he's moved to discover. Before he can make much progress, Sir Simon, an obnoxious parvenu who has ingratiated himself as the prince's food taster, samples a new blend of snuff belonging to Lord Petersham at a dinner party--with fatal results. Believing he was the intended victim, Prinny orders Beau to find out who put the poisoned snuff in Lord Petersham's box. Petersham himself is a suspect, and it will take the intervention of Brummell and his pet, Chakkri, "the only Siamese cat in England," to clear the lord's name. In the end, the chivalrous Beau risks social ruin to bring the real murderer to justice. Stevens, with several Regency romances to her credit, shows that her familiarity with the era has not bred contempt. Her mastery of the language and knowledge of the conventions and morals of the British aristocracy allow her story to ring true. With a cast of enjoyable characters both real and fictional, and a string of red herrings, hidden motives and plot twists as intricate as a well-tied cravat, this story will delight both historical mystery and Regency fans." "The author smoothly integrates the superficiality of the court with a darker undertone making THE TAINTED SNUFF BOX work as an historical novel and a window on contemporary society. While the tone is light, Stevens adds weight to a well-developed plot that is balanced with historical figures and fictional characters." 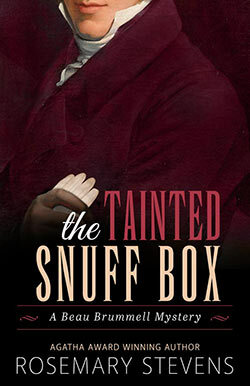 "Rosemary Stevens brings the essence of the Regency era, as well as the personality of Beau Brummell, to sparkling life in THE TAINTED SNUFF BOX. This is a delightful story with a well-plotted puzzle. Readers will be charmed by the tale of mores and murder." "Stevens has surpassed her flair for a well-drawn who-done-it regency mystery. Avid historical fiction readers will want to read and devour this superb page-turning novel." "This has been a terrible night. To think someone here at the Pavilion would wish the Prince of Wales harm. It is beyond all reason," Mrs. Fitzherbert said, indignation in every word. "If it were not for Sir Simon, I would be the one dead," the Prince reiterated, groaning. Mrs. Fitzherbert glanced at him sympathetically and patted his hand. Here was my cue. "Doctor Pitcairn, I cannot help but admire the rapid way you concluded Sir Simon had been poisoned. How did you do it?" Doctor Pitcairn released the Prince's hand. "Your pulse is returning to normal, your Royal Highness." The respected doctor looked at me then gathered instruments into his bag. "As to the poison, in my opinion, it was Prussic acid. A distinct odor of bitter almonds, combined with the blueness of Sir Simon's mouth and the speed with which the death occurred, leaves me in no doubt." So much for a heart seizure. Or an accident. "Oh, do stop speaking of it," the Prince cried. "What shall I do now that there is a killer at the Pavilion? How can I leave my room? How shall I eat without Sir Simon testing my food?" Mrs. Fitzherbert dipped a lace handkerchief in a bowl of water and tenderly stroked Prinny's brow. Freddie looked at me. In a low voice, she said, "George, what can be done? Will the Prince be safe here?" "He has enough guards. He can appoint one of them to be food-taster," I responded. "I barely know Bow Street's Jack Townsend, but-"
"What are you saying, Brummell?" the Prince demanded. "Do you know something? After all, it was your friend Petersham's snuff which caused all this." Everyone in the room was suddenly very still. Suspicion fell on Petersham, just as I had feared it would. "Sir," I said earnestly, "I know for a certainty that Lord Petersham could have had nothing to do with this. He and I have been friends for years. He is simply not capable, nor would he have reason to harm you. He is your friend as well as mine." The Prince sat in his bed looking as miserable as a child with a putrid throat kept indoors on a fine day. "Friend or no, it was his snuff box and his snuff. I don't know whom to trust. These past days have made me doubt my own judgement. I don't know if even Jack Townsend's skills will be enough to get to the bottom of this." Freddie stood beside me, looking up at me with her china-blue eyes. You may call me silly, but I believed she was waiting for me to offer my help. Indeed, I felt she expected it of me. I confess, I was feeling a bit puffed up with my own consequence after having recently solved another case of murder. The process had not been easy, but perhaps I could do it again. And there was Petersham to think of. I cleared my throat. "Sir, I give you my word of honour as a gentleman that I shall find out what is going on. I shall do everything in my power to uncover the killer." Freddie gazed at me approvingly. The Prince's tears ceased, and he fixed me with an unwavering glare. "No matter who he is?" "No matter who he is," I promised. Considering what happened in the ensuing days, I have to wonder if standing in front of a fire-breathing dragon might not have been a better course of action.